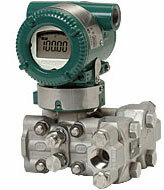 The EJX115A is a low flow differential pressure transmitter and is part of the EJX-A series. It is assembled with an integral flow orifice, making it excellent for very low flow measurement. It outputs a 4 to 20 mA DC signal corresponding to the measured flow. Its highly accurate and stable sensor can also measure the static pressure which can be shown on the integral indicator or remotely monitored via BRAIN or HART communications.